People often ask me what is the difference between craniosacral therapy (CST) and craniosacral fascial therapy (CFT)? And how does myofascial release (MFR) fit into the mix? I learned craniosacral therapy from the cranial osteopaths, chiropractors, and later from the Upledger Institute. No one mentioned the clinical importance of the fascial web in any of the trainings. By 1979 I was finding that some people responded well to CST and others had no positive effect. I asked myself why? In the summer of 1980 I found that a patient's neck wanted to move around during CST, so I just let it go. When she felt better, I believed I was onto something. When I started to incorporate this "work" into my CST, my results improved dramatically. When I moved to Philadelphia in 1983, I found out through John Barnes' brilliant teaching that I unknowingly found myself in the fascial web. I felt the determining healing factor of my former patients was in this web. If the fascia had been free, the patient did well with CST; if the fascia had been tight, CST had little or no effect. In my mind the fascial web appeared to rule the craniosacral system. I believed that the marriage of two great therapies, craniosacral and myofascial, into craniosacral fascial therapy was the ticket. When I added my periodontal oral/pharyngeal aspect, I felt something special was born. Later, I discovered a direct connection between the craniosacral and fascial systems, since a research study showed that cerebrospinal fluid was found in the collagen tubules. In essence I was getting maximum clinical results because I was treating the entire craniosacral fascial system. When the infant research started in 2006, Krissy, Mike, and I found that the fascial strain patterns in newborns/infants virtually overrode the craniosacral system. Thus, we do not do/teach any specific cranial or sacral techniques for newborns/infants. Even more importantly, we found that if we truly listened closely to their full-body strain patterns and allowed them to drive their own motion/correction/healing, we obtained the best results. We found that each infant holds the memory of her/his in utero, labor, delivery emotional and physical traumas and knows innately what s(he) needs to do to heal her/himself. Once we let go of our egos and surrendered to this knowing in our research, infant CFT became pretty routine. When the fascial web fully released, the cranial bones and sacrum amazingly seemed to correct on their own. As we move forward in time, the goal in CFT is for every infant on the planet to have triple digit brain and sacral cycles with a free fascial web. 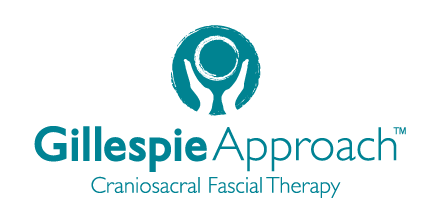 The Gillespie Approach specifically revolves around the evaluation and treatment of the patient's craniosacral fascial system. This system has three important aspects: craniosacral, fascial, and oropharyngeal. By 1975 Dr. Gillespie had completed four years of dental and two years of periodontal and TMJ specialty education, which gave him a firm scientific background in the oropharyngeal area. In the late 1970s Dr. Gillespie began his cranial training in applied kinesiology with Dr. George Goodheart. He then studied the cranial osteopathic principles under Dr. Viola Frymann who learned directly from Dr. William Sutherland, the discoverer of cranial motion. When Dr. Gillespie moved to Philadelphia in 1983, he worked with John Barnes P.T., the creator of myofascial release, for about ten years. In the 1980s Dr. Gillespie saw the great value of combining the craniosacral, fascial, and oropharyngeal concepts into one approach. Some people do great craniosacral work, which treats part of the craniosacral fascial system. Some people do effective myofascial therapy, which treats part of this system. Some dentists do fine TMJ work, which treats part of this system. The Gillespie Approach evaluates and treats the entire system. The GA recognizes the importance of the expanding/contracting brain, unrestricted fascia, and healthy oropharyngeal physiology. To fully understand a nursing issue as a lactation consultant, a speaking condition as a speech therapist, a malocclusion as an orthodontist, or a TMJ problem as a dentist, you must understand the oropharyngeal aspect of the craniosacral fascial system.